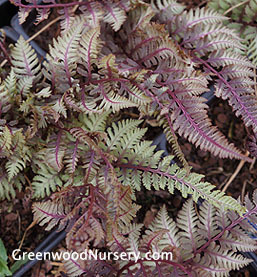 The Japanese Painted Fern is one of the more colorful low growing ferns. Slow spreading with soft gray green fronds, Japanese Painted Ferns are accented with silver and burgundy shades. A great way to brighten up shade gardens, woodland gardens or container gardens. You will find Japanese Painted Ferns are hardy through out the United States except in the desert regions. Named Perennial Plant of the Year in 2004, Athyrium niponicum var. pictum is a popular cultivated fern with slow spreading clumps. Plant in shade gardens, near streams or ponds. Part to full shade.